As I have time during vacation, I have computed the data that I have on the wines that I have drunk. I drink old wines since 1975 but I have data only since end of 2000. 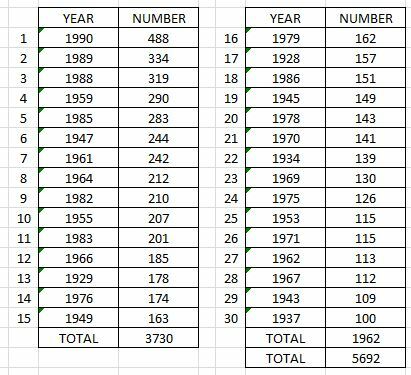 Here are the wines per year that I have drunk for the last 17 years. When I have drunk only one wine for one vintage there is no number in parenthese. 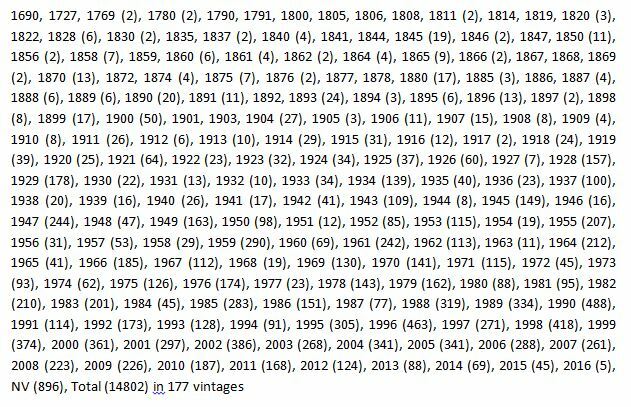 I have drunk 177 different vintages. Here are the 30 vintages that I have drunk more than 100 times, considering only vintages before 1991. As I had decided to write on all what I drink since end of 2000, I have data that I can analyze as I wish. It concerns nearly 15,000 wines on which I have notes. I know that my trip in the world of wine does not represent the normal trip which is generally followed, but it could be interesting to give you some remarks on the way I have drunk wine on the last 16 years. I have divided the 16 years in periods of 4 years and I have tried to see if there are evolutions or tendencies. There is no pretention, no will to show, just the will to give a testimony. I drink old wines since 1970 but seriously since 1975. As my first notes were made end of 2000, there are 25 years of great wines for which I have no notes, and it makes me sad. My fault. In the first period analyzed, 2002 – 2005, I was not very well known so the events that I could create to drink wines were less numerous as in the three periods of 4 years which follow. The period when I have drunk the greatest number of wines is 2006-2009 with 4,159 wines. This represents 20 wines per week, nearly 3 per day. Said like that, one could think that I drink much too much but I have two remarks : when there is an official tasting in fairs or in a Domain, I drink only a sip of each wine. The second remark is that except for champagnes; I spit nearly every wine that I drink, in any circumstance, family, winery, restaurant and so on. All the restaurants where I go know that I will use my silver timbale. The first thing which appears is that my consumption of Bordeaux (including red, white and liquorous) has been divided by two on this period. 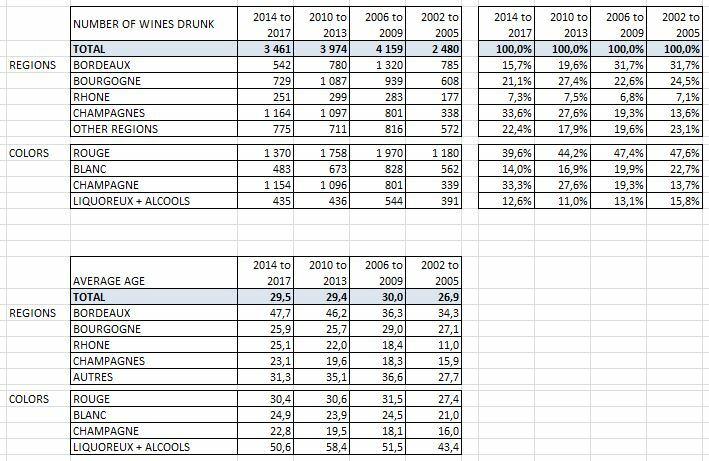 Bordeaux was 32% of what I drink and now is 15,7% on the last 4 years. The reasons could be that I have a greater interest in Champagne which represented less than 20% and is now at 33,6%. There could be some other reasons : in restaurants, it is no more possible to order great Bordeaux because the prices are crazy. Another reason is that I have discovered the world of old champagnes to which I allow significant budgets. The number of champagnes drunk has exploded and the age of the champagne that I drink come from 16 years to attain 23 years now. More and more I consider that for each penny that I put in buying wines, the pennies put on old champagnes give me a greater pleasure when I drink them. The Bordeaux that I still drink are older and older because I take them from my cellar and less from restaurants. The fact that I open generally on 16 years more than 2 sweet wines per week, mainly Sauternes, is significant, because in the general trend of ignoring sweet wines, I continue to open these wines. It is due to my love for very old sauternes. I have calculated the average age of wat I drink. If I drink a 1990 in 2005 it has 15 years and if I drink it in 2015 it has 25 years. Globally The average of what I drink has 30 years, among which the sweet wines have more than 50 years. I wanted to go deeper in the analysis in keeping only wines having 20 years or more. Approximately I drink 50% of wines above 19 years and 50% of less than 20 years. For someone who is considered as drinking only old wines the young wines that I drink are very significant. This is due to what I drink in restaurants, in Domaines and in wine fairs. If the wines have 20 years or more, their average age is 50 years and it has not changed on the 16 years. For Rhône and Champagne, my interest for old wines has extremely expanded in terms of age. 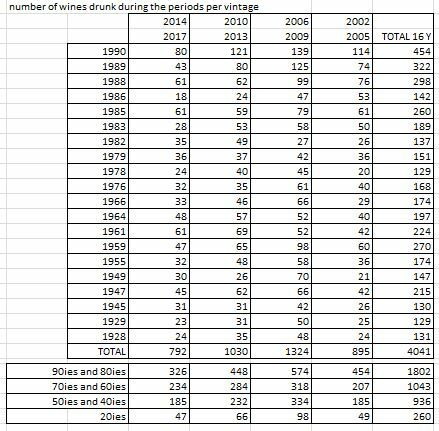 As it can be imagined, old wines (20 years or more) represent nearly 80 of what I drink in liquorous because I do not see the interest in drinking young sweet wines. 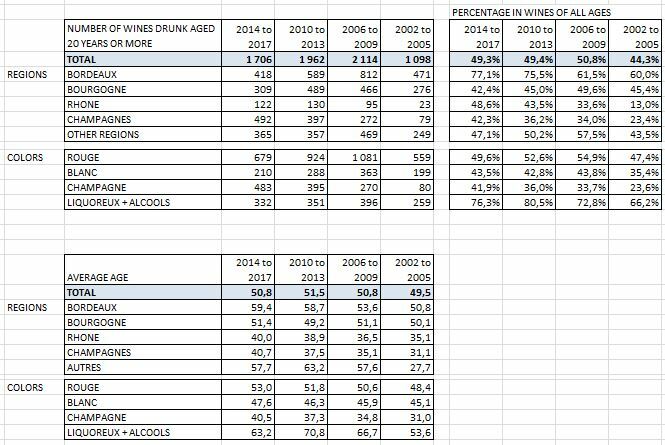 Same is for Bordeaux with 77% of wines having 20 years or more because for me a Bordeaux of less than 20 years does not provide what I expect. I drink more than 8 old wines per week, so, more than one per day. This could mean that I have a certain passion for old wines! There is a factor that I have not considered up to now, it is my age. As I grow older, white wines, even if I spit represent a heavier weight on my body. Champagne is what I can drink more easily, even I do not spit. In summer, heavy wines are difficult to drink, when champagne is easily consumed. My love for old champagnes has transformed my life of wine lover. I continue to love old wines and even if the wines available on the market have not the same quality as what I used to buy 40 years ago, I continue to buy and drink these wines which give me unparalleled pleasure. I hope that this text was not too boring to read. I do not pretend to represent the world of wine which has so much changed in the last 20 years (problem of fakes and too early consumption of wines which are not ready to be drunk), but I thought that my testimony could be of interest even if tiny. I have tried to see for the vintages that I have drunk the most if there is a tendency. To my surprise I see that on the last 4 years I have drunk less wines from these cherished vintages. Cette entrée a été publiée dans statistiques le 10 janvier 2018 par François Audouze.